“Our poll shows Clinton at 47 percent and Trump at 45 percent, which is at our margin of error,” said Doug Kaplan, the managing partner of Gravis Marketing, the Florida-based polling company that executed the poll. The poll carries a margin of error of two percent with a 95 percent level of confidence. Libertarian Gary Johnson has the support of three percent with Green Party nominee Dr. Jill Stein the choice of one percent, he said. Democratic pollster Patrick Caddell said the election is still up for grabs with up to 12 percent of the electorate still “floating” between the two candidates. “The whole country is in motion and states in play are going all together,” he said. 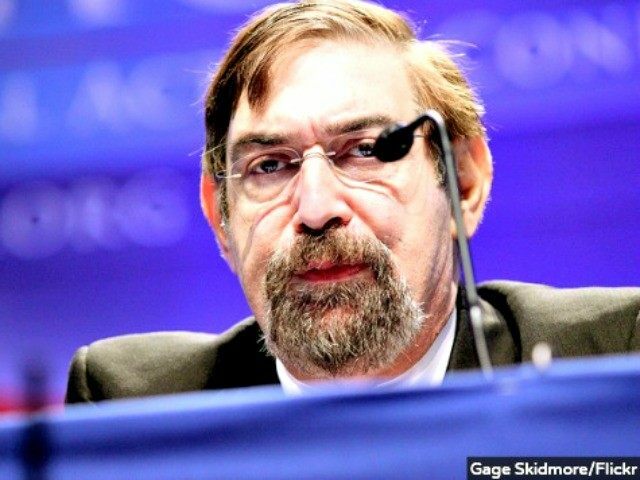 If Trump makes the election a personality or character contest between him and Clinton, he will lose, Caddell said. Both candidates have almost the same unfavorable ratings, so it is a wash there, but the head-to-head contest obscures the solid alignment of Trump and the voters on the important issues, such as trade, refugees, immigration, and the idea that an elite has been running the country for their own benefit, he said. The momentum is with Trump, and there is no comparison with the weaker momentum of Republican W. Mitt Romney that stalled in 2012 in the last days of his campaign against President Barack Obama, when Hurricane Sandy made landfall on New Jersey Oct. 29, just over a week before the Nov. 6 election, he said. “Romney’s momentum was never this great, let’s get that straight,” he said. “They had thrown that election away–hurricane or no hurricane–there was nothing like we are seeing now in terms of volatility, the anti-establishmentism and the protest voting,” he said. In addition to their presidential preference, poll participants were asked a series of policy and attitudinal questions to gauge the mood of the electorate. Caddell said one of the most important results in the poll was the response to the question as to whether the “Political Elite and Special Interests” win or lose if Trump or Clinton win or lose. In the general sample population, 65 percent of respondents said “Political Elite and Special Interests” win if Clinton wins and 35 percent said they lose if the former first lady takes the White House. If Trump wins, 43 percent said “Political Elite and Special Interests” win and 57 percent said they lose. Caddell said that inside the segments of the sample population, among people with a single college degree, 66 percent said the elites win when Clinton wins, and it was also the response of 58 percent of people with advanced degrees. This alignment with the Trump voters among voters that are supposed to be hostile to Trump is very significant, he said. “This is the argument that could move the election” he said. Asked: “Why do you think FBI Director James Comey chose to reopen the investigation into Hillary Clinton’s use of a private email server while Secretary of State after the agency recently uncovered thousands of emails on the laptop used by Clinton’s closest adviser?” fifty-seven percent of participants said Comey believed that he found something significant and 43 percent said Comey was trying to influence the outcome of the election. Fifty-six percent said the FBI’s reboot of its investigation will have no effect on their vote, while 21 percent said it was “More Likely” to affect their vote and 22 percent said it would be “Less Likely” to have that effect. Participants were asked three questions dealing with the issue of whether Clinton would be pardoned. Asked: “Should President Obama publicly announce before the election that if Hillary Clinton is elected, he will not pardon her for any crimes prior to the election?” Forty-one percent said the president should make that pledge and 34 percent said he should not. Forty-one percent of respondents said Clinton should announce that she will not accept a pardon from the president, but 31 percent said she should not. Forty-eight percent said Clinton should announce that if she is elected president, she will not pardon herself and 31 percent said she should not. Participants were also asked questions to determine whether there is a consensus for change. The poll was conducted using interactive voice response polling and an internet panel of cell phone users with results weighted to match a proprietary turnout model. The party breakdown of participants is: 46 percent Democrat, 38 percent Republican, and 16 percent Other. Thirty-seven percent of respondents said they had already voted, 11 percent said they would vote before Election Day and 51 percent said they would vote Election Day.